Years before Radiohead invited yet another wave of critical fawning by offering an album for free download, the Arctic Monkeys cultivated a rabid following by giving away demos of early CDs and eschewing the radio for the Internet (especially MySpace). Reviewers documented the shift as a potential vanguard of 21st century marketing, which may be true, but let’s have people attribute most of the Monkeys’ success to their talent, yeah? A key band in the recently departed decade’s post-punk/new wave revival, along with The Strokes and Franz Ferdinand, the Monkeys revved up their engines for their debut album. After giving it an inaccessible title and terrible cover image, they watched it become the fastest selling debut album in UK history. Given that country’s success with music, the sales’ numbers are staggering, but much of the hype is warranted. Indeed, they’ve had a stronger start to their career than obvious influence Oasis, whose Definitely Maybe they knocked off the aforementioned chart. 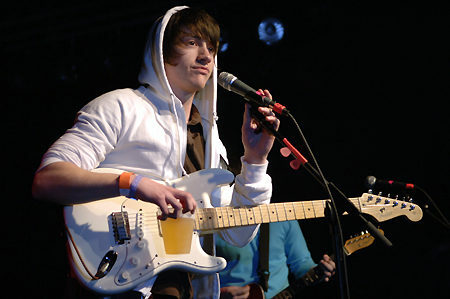 2006’s Whatever People Say I Am, That’s What I’m Not swaggers through dense, punky gems and the occasional pull-back-on-the-reins ballad, with the band’s frenetic, aggressive playing style naturally complementing frontman Alex Turner’s lyrics about those clubs and girls he can’t get into and those drinks and girls that don’t get into him. On tracks like “I Bet You Look Good on the Dancefloor,” “Dancing Shoes,” “Still Take You Home,” and the wonderfully titled “You Probably Couldn’t See for the Lights But You Were Staring Straight At Me,” Turner skewers arrogant girls (“You’re probably just alright, but under these lights you look beautiful”) and the guys who play into their hands (“Those that claim that they’re not showing off are drowning in denial”), but never totally exculpates himself either. Such tracks work so well because of his enviable gift for melody and the overriding sense that, despite whatever jealousy or bitterness gurgles over, they’re having fun. The second half doesn’t quite match the first for original tunes, but by the time you hear Turner singing, “There’s only music so that there’s new ringtones” on the glorious “A Certain Romance,” you’ll probably be ready for another spin. As Coldplay was putting the finishing touches on 2005’s X&Y, I recall reading a few music critics who noted that the third album often dictates the rest of a band’s career. Sometimes you get Born to Run, London Calling, War, OK Computer, or Dookie and critics love you forever; other bands, like Oasis and the Stone Roses, can’t do much past two. Perhaps aware of the stakes, the Monkeys enlisted Queens of the Stone Age frontman Josh Homme to produce and give their music a darker, more mysterious vibe. For 2009’s Humbug, the pace has slowed, the bass has been cranked, and the musical palette gotten more colorful. 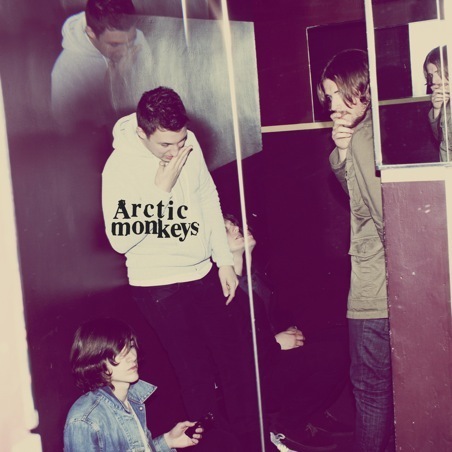 Despite the ten-song track order, Humbug has its share of duds, primarily the result of the band succumbing to boredom in the shift away from energy (“Fire and the Thud,” “The Jeweller’s Hands”) or not knowing whether to keep things fast or slow (the nevertheless quirky “Pretty Visitors”). That keeps the album from climbing the heights of their debut, but all told, this is a more eclectic, interesting listen than anything they’ve put out to date. And no quibbles, minor or otherwise, surround “Cornerstone,” the album’s second single and the one track all critics couldn’t stop talking out. There’s a reason for that—it’s the band’s all-time high point, Turner proffering both his most indelible melody and heartbreaking lyrics yet. At first, it feels like merely a cute little ditty, with its protagonist running into all these girls who remind him of his ex. But in the bridge, Turner uncovers his deeper thoughts and fears. “Tell me where’s your hiding place,” he sings, his voice richer and more mature than ever before, “I’m worried I’ll forget your face / And I’ve asked everyone / I’m beginning to think I imagined you all along.” The apparent confusion over whom he sees reveals a desperate desire for a lingering connection to hold onto and a fear that memories will fade too quickly. No wonder that, when he smells that scent on the seatbelt, he “kept my shortcuts to myself.” Tied together with impeccable restraint and undeniable style, the words bring about a spectacular song, one whose second 50 plays are better than its first 50. They never could have written this song four years ago, and that realization, along with the increased musical range, is why, like Steady Diet and OK Computer, this third album will leave you feverishly anticipating what they’ll do next.